Epubor provides outstanding maintenance of its software products that includes technical support and regular new releases. We crave to constantly improve, fix and enhance our products. Thus, we release new minor and major versions rather often. Epubor supplies its software upgrades according to the following policy. 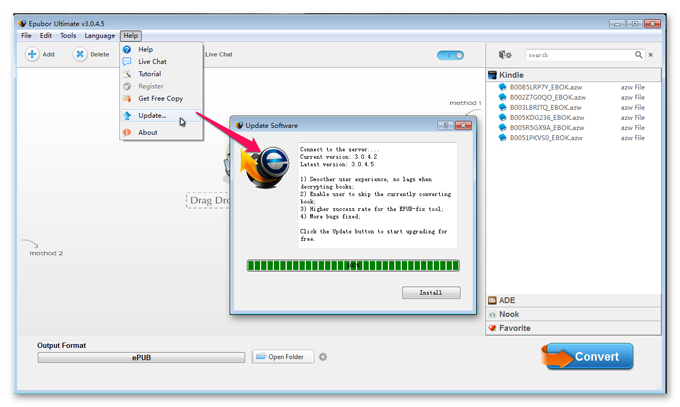 All current clients of Epubor are eligible for getting the new version of the purchased product totally free. To see the changes and enhancements for any product we develop, please locate a product information page on our website and scroll down to the "What's New" area. You will see the exact dates, build and version numbers and the full list of features added or fixed. You will find the Changelog useful in order to detect whether a trouble you have discovered in an older build was fixed. And decide to upgrade or not. In general a upgrade would keep your program registered. If you happened to lost your registration code and the new version asks you to re-register, please Retrieve new license code online, or send email to support@epubor.com, then our customer supporter will send you the registration code again. Method A: Simply download the latest build of the product from the list above. Directly install the latest build to replace your old version.